It’s a shame I only found out about this brand now. Introducing, CPS Chaps, a hip and young brand brought in from Thailand by the same people behind Bench. When I first stepped into the store, I was greeted by prints and color everywhere! This is definitely a recommended store for updating your summer wardrobe. Dots, stripes, florals, hyperbrights–you name it, they have it! One word of advice, be patient in browsing through the racks. They’ve got hidden gems all over! Like this cute eyelet top! 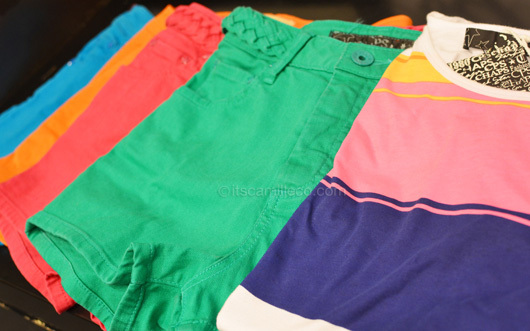 And these hyperbright high-waist denim shorts! I went gaga over them! Pair it with a cute shirt like this and you’re ready to greet the sun! There’s also something for the boys. While you’re lady is shopping her heart out, shop away at the men’s section too! So what did I come home with? Take a look at my outfit from CPS Chaps. There’s something about this combination that makes me want to don Mickey Mouse ears! I really have no idea why. Haha! I really love this sweater from CPS Chaps. Aside from the fit and my obvious love for polka dots, I love it because it can actually double as a cardigan too. It has buttons all over its back so you can just wear the back as the front and keep it open. Voila, cardigan! CPS Chaps is available at Trinoma and Bonifacio High Street.